A welcome addition to Two-Rock's catalogue. If you've always wondered what all the Two-Rock amps fuss was about but felt they were totally out of your league, now's the time to think again. A great take on classic Brit tone; fabulous pick attack; superlative build quality. The control panel lettering needs to be more visible. Two-Rock has always represented the pinnacle of acquisition for a certain type of guitar player. Originally based on the infamous Overdrive Special amplifiers designed and built by Howard (Alexander) Dumble in the 70s and 80s, Two-Rock has moved on and created its own unique designs for some time now. With an enviable user list that includes John Mayer, Brad Paisley, Oz Noy and our own Matt Schofield, Two-Rock amps are built without compromise and aimed fairly and squarely at the very top of the pro market, with a price to match. However, a new design has just been released that might make the Two-Rock sound slightly more achievable - and it's in the shape of a small, stripped-down head called the Cardiff. Inspired by the legendary Vox AC15 and AC30, the Cardiff is a straightforward single-channel head with a valve-rectified dual EL84 power stage, which is configured in class AB push-pull. 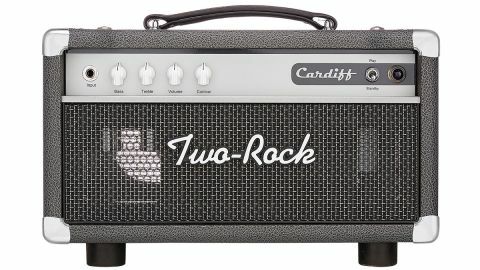 The Cardiff may be small, but it's still a Two-Rock and built to an exceptionally high standard, with distinctive grey vinyl over a heavy-duty cabinet and a heavy duty aluminium chassis holding a simple but very neat hand-wired circuit. The wiring and soldering has clearly been done by someone who understands old-school valve electronics, with wires bent at right angles close to the chassis and AC pairs neatly twisted. All the components are top quality, with generously sized mains and output transformers. It's a simple circuit, with around 20 components - nevertheless, the assembly and detail is first class. The Cardiff 's control panel has four white chickenhead knobs controlling volume, bass, treble and contour. There's a single guitar input jack, and around the back a pair of send/ return sockets for the series effects loop. Overall, the Cardiff exudes class and a rugged reliability that should last a lifetime. The Cardiff 's fat, punchy tone is great fun to play, with a fast attack and a bright but not ear-piercing treble that's matched by a smooth midrange and an unexpectedly powerful bass. As the Cardiff is turned up, a variety of different drive colours appear - from a subtle edge at around 10 o'clock that's great for chords, through to a powerful mid-heavy distortion that sits somewhere between classic Tweed and Vox grind, which is great for blues and classic rock. The Cardiff is sonically very transparent and lets all the guitar's character come through. It's also somewhat unforgiving to fluffed notes, which is common for many similar amps. However, get your chops into shape and you'll be rewarded with uncanny dynamic response and touch sensitivity, both of which are Two- Rock trademarks. Despite only being 15 watts, the Cardiff is louder than expected thanks to its oversized power supply, with plenty of volume for small to medium gigs. Turned up to around three quarters, there are some stunning solo tones that clean up very nicely as the guitar's volume control is backed off. The tone controls work smoothly and interact nicely with no nasty peaks. The Contour control is a Two-Rock speciality, behaving as a sort of expanded presence control, with a neutral position at 12 o'clock. Turning the knob clockwise from this point adds a subtle, almost hi-fi sheen, while rotating anti-clockwiseadds extra warmth without descending into muddiness. It's a subtle effect, but one that makes a significant difference. The Cardiff shares the same legendary build quality and attention to detail as its more expensive cousins, with a rich tone and plenty of flexibility from a deceptively simple control layout. The only fly in the ointment for us is the control panel lettering, which is a little too minimalist to read easily, especially if you wear glasses! We'd use a bolder font and reposition the control names over the knobs, for improved visibility, although with only four of them to memorise, it's no big deal. The price is significant. While the Cardiff is built to the same uncompromising standards as all Two-Rock models, it's relatively affordable. It's still aimed at the top of the professional market, and yet this is possibly the first Two-Rock that's not just aspirational for us mere mortals, but actually achievable.